Bomma the Champ enters the arena first. He comes down the aisle wearing black and brown trunks with red accent stripes. Tall and articulate looking, he sends tingles up some of the fans legs. On the way to his corner he stops in center ring and waves to the crowd. Turning to the teleprompter he says “If anyone has a better idea, I will happy to listen to it.” The crowd roars their approval, and the Champ, whose ring name is The Messiah, makes his way to his corner and sits on his stool. The crowd looks around. Here comes the challenger down the aisle from the other side, wearing lily white trunks with off-white stripes and tea colored accent dots. Not green tea, more like an English Breakfast hue. The grand entrances of champ and challenger coming down the aisles give the scene an aura reminiscent of a wedding. In politics the fight comes first and the wedding follows much later. We saw that with Bush the senior and Clinton, the one named Bill. In a real wedding, of course, the wedding comes first and the fights come later. Now Baynor slips under the ropes and climbs into the ring. He has no teleprompter. He speaks from the heart. You can tell he is nervous; it’s his first big fight. The challenger scans the crowd then looks at the ring. The crowd grows quiet. Baynor speaks. “Why do they call this thing a ring? It looks like a square to me.” A twitter goes through the audience as his fans turn and give each other a facelook. One calls out “I digg it!” as Baynor takes his seat. The referee calls for the traditional bi-partisan handshake. Bomma shakes his hand. Baynor shakes all over. Baynor leans forward. Bomma leans back. There is no hug. Baynor leads with a budget cut swing at Bomma’s body, but Bomma sidesteps away from it. Now Baynor aims for the head with budget cuts again. Bomma didn’t know to duck. His teleprompter was stuck. Down but not out, the champ is up at the count of three. Now it’s Bomma’s turn. He throws three quick jabs – special interests, working man’s enemy, capitalist – but the blows all glance off. All fired up now, Baynor fakes to Bommas’s left with a spread the wealth charge. Bomma takes the bait and looking to his left for advice the challenger land a hard right to the chest with four dollar gasoline. The champ is down again. The ref is counting. The champ is thinking. The judges will say he lost the round, especially Judge Al Lido. Bomma knows he needs a knockout to win. The champ is up. He dances left. He dances right. He hauls back for a swing with all his might. The blow was his legendary racist punch. It sends Baynor to the ropes. Baynor’s badly beaten and bleeding, but he’s still standing by the ropes in the square. The Messiah smiles. His confidence is back. Then WHAMMO! 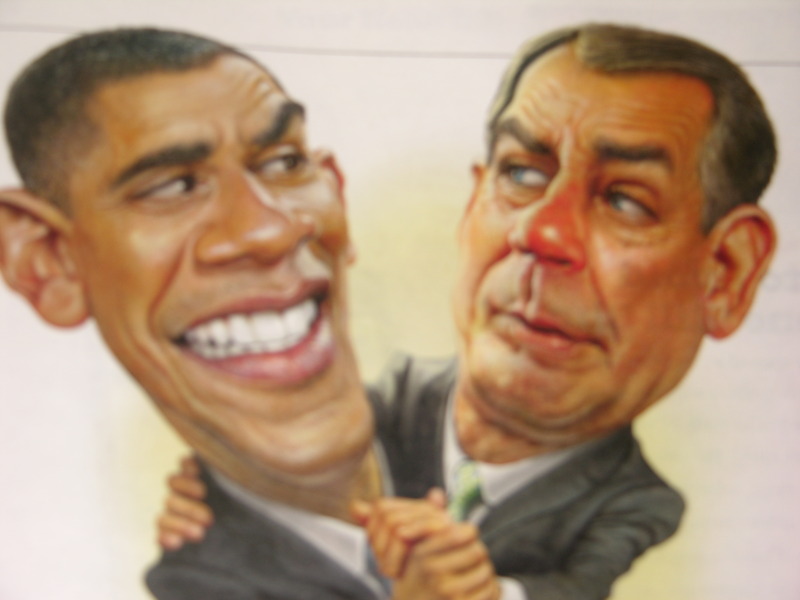 Baynor lands a healthcare to the head followed by two quick jabs – appease our enemies, alienate our friends. Bomma is swaying. Baynor slams a hard left spread-the-wealth to the jaw and a jobs uppercut to the chin. Then came the finale. Bomma never saw it coming. It was a powerful take-back-America slammer direct to the face from the right. A hard man to beat. Bomma was back on his feat by the count of nine. One eye was puffed up, his nose was out of line and he was hearing ringing in his ears. It was the end of round one. Saved by the bell.